We insist that our drivers maintain GDP standards and understand that they are the connection point to your customers, in doing so become an extension of your business and as customer facing, have to deliver on your reputation. That’s why we have strict recruitment and training standards that all our drivers have to go through. LF&E currently employ over 80 drivers throughout our seven locations nationwide. Drivers and the business as a whole employ GDP standards (Goods Distribution Practice) to ensure medicines that are collected from you or your licenced suppliers are constantly handled, transported and stored in suitable conditions as directed by the MHRA. All drivers as part of the recruitment shortlisting process and prior to employment being offered are DBS checked (Disclosure & Barring Service) (Formerly the Criminal Records Bureau (CRB) for your peace of mind and security. To further deliver upon your customer service requirements, wherever possible drivers are assigned the same routes to build up rapport with your customers that re enforces trust, reliability and confidence. 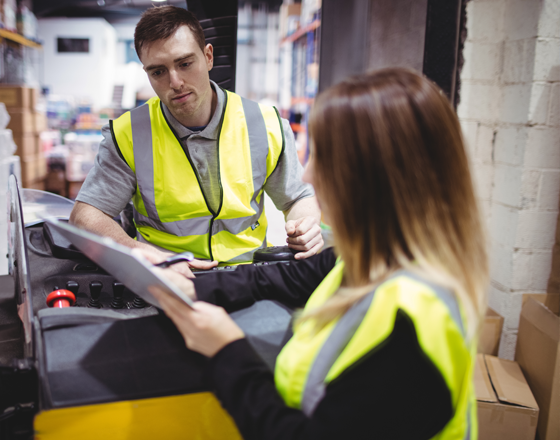 Before being allowed to work on any client account, drivers are required to attend and pass a five day rigorous training and induction program on the exceptionally high standards LF&E requires to service its customers. Our induction program includes modules around delivering high customer service, competency in vehicle operation, goods handling, technology and reporting standards to ensure they are competent to work in this highly regulated and compliant industry. All drivers as part of their induction program, and periodically they are required to undertake driver learning and training programs both online (e­learning) and in person with accredited driver training providers. This commitment ensures we prioritise the safety of our drivers and contributes to our Duty of Care obligations. Continued performance data is measured from vehicle tracking data to client feedback surveys ensuring our drivers are delivering to the absolute highest standards. Additional licence and medical checks are included in the ongoing assessment program all drivers work under. Working in an industry sector where time and temperature sensitive deliveries are imperative it is key obtaining the right logistics partner and Lf&e are certainly that. It is a please to work with a company that has the same ethos of customer service, attention to detail and willingness to assist and go the extra mile ensuring that they exceeded our expectations. Lf&e are our sole logistics provide, we have employed their services since the inception of Medicines by Design & they have never let us down, they understand that they are the face of our business and we see them as an extention of our business. Lf&e and their drivers provide us a professional discreet services which is essential in the nature of the products that we provide. They tailored a bespoke service that works around our business always willing to help out no matter when, which has been a refreshing change – thank you!